A lubricant is a substance that is used to reduce friction and control wear between surfaces that are in contact with a relative motion. Automotive lubricants sold in the aftermarket are required for maintenance and smooth operation of vehicles after their purchase. Typically, a lubricant consists of approximately 80% to 90% base oil, and the rest is additives. However, these percentages vary according to application. Characteristics of a good lubricant include high boiling point, high viscosity index, corrosion retardation, thermal stability, low freezing point, and resistance to oxidation. Lubricants are used for their ability to increase the operating lifespan of mechanical parts. They can also eliminate any residue deposited over mechanical parts. Additives are added to the base oil to impart various properties to the lubricant and improve its performance. Lubricant additives are inorganic and organic compounds that are dissolved or suspended as solids in lubricants or base oils. in terms of type, the automotive lubricants aftermarket can be classified into engine oil, gear oil, transmission fluid, and others (including brake oil, greases, coolants, etc.). Aftermarket customers require lubricant suppliers to help them reduce their total operating cost. For instance, extended oil drain intervals help fleet owners to reduce their operating and maintenance cost, primarily by keeping cars and trucks on road for a longer duration of time. The type and quality of the lubricants used has a significant bearing on engine performance, fuel economy, and vehicle life. For instance, European cars and trucks have smaller, more fuel efficient and higher performance engines than vehicles in North America and Asia. Better fuel economy in cars can be achieved by reduced engine and gearbox friction, which is achieved by using lower viscosity and friction-modified lubricants. Increase in automotive vehicle fleet has been the main driver of the automotive lubricant aftermarket. The vehicles in operation all over the world require lubricants at frequent time intervals for smoother engine operation and fuel economy. The total global vehicle fleet, including passenger cars and commercial vehicles, stood at 1.28 billion in 2015 and is projected to cross the 2 billion mark by 2035 and 2.5 billion by 2050. Increasing vehicle fleet around the globe is a key indicator of increasing demand for aftermarket automotive lubricants in the near future. The total number of new vehicle sales stood at 96,804,390 units (including passenger cars and commercial vehicles) in 2017. The rapid increase in sales of vehicle in developing countries and development of infrastructure have created a strong demand for aftermarket automotive lubricants. Increase in manufacturing of vehicles is one of the major factors contributing to the expansion of the global automotive lubricants aftermarket. Rise in demand for low viscosity fluids in the automotive sector is expected to boost the automotive lubricants aftermarket during the forecast period. The engine oil segment dominated the market in 2017 and is expected to expand at a significant rate during the forecast period due to increasing number of vehicles. Engine oil has to be changed frequently after every 5,000 miles to 15,000 miles of vehicle usage depending upon the engine and base oil used. This is expected to boost demand for engine oil. A unique feature of the global automotive aftermarket lubricant industry is that there is no significant slowdown in the consumption of aftermarket lubricants during economic downturns or market slowdowns. For instance, when vehicle sales go up, there is more consumption of lubricants, whereas even if new vehicle sales go down, the running vehicle fleet requires lubricants at frequent time intervals for smoother operation. Oil changes in vehicles become more frequent as they grow old. Therefore, even during unfavorable market conditions, customers have to purchase lubricants in order to maintain the current fleet of vehicles. In 2015, there were about 1.1 billion light passenger vehicles, of which 0.9% (9.9 million) vehicles were electric, while the rest were internal combustion engine (ICE) vehicles. Out of the total number of light electric vehicles (9.9 million), 0.1% were battery electric vehicles (BEV) and the rest were hybrid electric vehicles (HEV/PHEV). Despite the marginal penetration of electric vehicles, the move toward electrification of automotive vehicles is likely to gain further impetus as electric vehicles help reduce emissions to meet the CAFÉ norms and various emissions norms set across the world. Since battery electric vehicles do not have internal combustion engines, they do not require engine oil. They only consume small amounts of greases and other products. This is expected to hamper demand for light vehicle lubricants in the near future. Currently, mineral engine oil dominates the global automotive lubricants aftermarket due to its reasonable price. However, the market share of semi-synthetic and synthetic engine oils is likely to increase in near future, due to increased product knowledge and higher awareness among consumers. As modern lightweight vehicle engines are put under enormous stress, automakers worldwide are shifting toward lubricant grades with less viscosity to support achieving higher mandated fuel economy standards and emission requirements. This has led to increasing consumption of synthetic and semi-synthetic lubricants in newer cars, and it presents a significant market opportunity for all the aftermarket service providers. Synthetic engine oils are made with a variety of performance additives and synthetic base oils. Unlike mineral base oils, synthetic base oils are engineered with molecules of uniform shape and size and are optimized to consistently perform better than mineral base oils. Synthetic oils offer many advantages for newer and advanced engines. They don’t break down as easily as mineral oils, which means they protect the engine longer from excessive metal-to-metal contact that causes wear. Synthetic engine oils also function better in extreme hot and cold temperature conditions. They are paving the way for next-generation engine technology. The inclination toward use of lower viscosity oils to achieve newer grades such as 0W-20, 0W-30, and still to come 0W-16 requires the use of synthetics. Automakers are demanding even lower viscosity grade lubricants, for example 0W-8, which is possible only with synthetic formulations. Japanese cars have used 0W-20 grade lubricants for several years, and their U.S. and European counterparts are now following in their footsteps. When the new ILSAC GF-6 specification becomes active in near future, synthetics are expected to play a more prominent role. Consumers in developed and developing regions have different mobility needs. Continued urbanization is likely to lead them toward car ownership. The global lubricants industry has seen a dramatic rebound since the global economic recession of 2008–2009. One of the key drivers of this rebound is higher demand for lubricants from developing economies. This can be ascribed to the surge in new vehicle sales and rise in number of on­road vehicles in Asia Pacific, Latin America, and Middle East & Africa. Economies of rapidly expanding countries of the market such as China, India, and Brazil are expected to achieve significant growth rates in the near future. This is anticipated to drive the global automotive lubricants aftermarket. The global automotive lubricants aftermarket is a highly organized market with top players accounting for majority of market share. Key players operating in the Automotive Lubricants Aftermarket are Royal Dutch Shell plc, ExxonMobil Corporation, BP p.l.c., Chevron Corporation, Total S.A., Sinopec Corporation, Fuchs Lubricants Co., LUKOIL Oil Company, Valvoline, Phillips 66, Bharat Petroleum Corporation Limited, JX Nippon Oil & Energy Corporation, Repsol S.A., Petrobras, Petronas, and Indian Oil Corporation Limited. Automotive Lubricant is a substance made of base oil, which is derived from crude oil, and additive package. The base oil used in lubricant formulations is of mineral, synthetic, and semi-synthetic in nature and significantly determines the properties of finished lubricants. Additives are added to the base oil to impart various properties and improve its performance. Lubricant additives are inorganic and organic compounds that are dissolved or suspended as solids in lubricants or base oils. The aftermarket for automotive lubricants deals with lubricants required or consumed by an automotive vehicle after its purchase over its lifespan. Lubricants are used for their ability to increase the operating lifespan of mechanical parts. They can also eliminate any residue deposited over mechanical parts. Almost all the lubricant manufacturers derive a significant portion of their revenue from the aftermarket. Emerging environmental regulations make the players in this industry more proactive as they have to produce lubricants that reduce friction while containing emissions. Original equipment manufacturers mention specifications and requirements regarding lubricants they plan to use in engines. Lubricant manufacturers provide them with products that meet these specifications. The automotive lubricants aftermarket is expected to be be propelled by the rising demand for engine oils, which have to be changed at frequent time intervals. Increasing need for car ownership across the population of emerging economies is one of the factors anticipated to drive demand for aftermarket automotive lubricants. Consumers in developed and developing regions have different mobility needs. Continued urbanization is likely to lead them toward car ownership. Moreover, rise in awareness about benefits of timely oil changes to maintain vehicle efficiency and achieve better fuel economy and increasing emphasis by automakers on engine downsizing to meet vehicular emission norms are some of the factors that mandate the use of high- performance lubricants and are expected to drive demand for them during the forecast period. 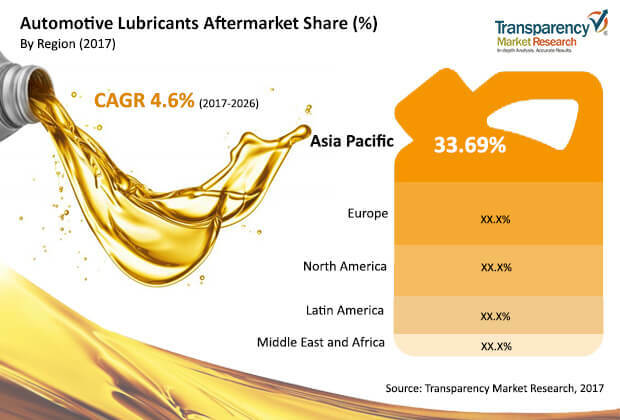 Furthermore, rise in world vehicle fleet and increasing motorization rate particularly in Asia, Latin America, and Middle East & Africa are further expected to create incremental opportunity for automotive lubricants in aftermarket. This report analyzes and forecasts the market for aftermarket automotive lubricants at the global and regional level. The market has been forecast based on volume (kilo tons) and revenue (US$ Mn) from 2017 to 2026, considering 2016 as the base year. The study includes drivers and restraints of the global automotive lubricants aftermarket. It also covers impact of these drivers and restraints on demand for aftermarket automotive lubricants during the forecast period. The report also highlights opportunities in the automotive lubricants aftermarket at the global and regional level. The report includes detailed value chain analysis, which provides a comprehensive view of the global automotive lubricants aftermarket. Porter’s Five Forces model for the automotive lubricants aftermarket has also been included to help understand the market from the perspective of various stakeholders involved in the value chain. The study encompasses market attractiveness analysis, where in types and application are benchmarked based on their market size, growth rate, and general attractiveness. The study provides a decisive view of the global automotive lubricants aftermarket by segmenting it in terms of type and application. In terms of type, the automotive lubricants aftermarket can be classified into engine oil, gear oil, transmission fluid, and others. In terms of application, it can be segmented into passenger cars and commercial vehicles. These segments have been analyzed based on present and future trends. Regional segmentation includes current and forecast demand for aftermarket automotive lubricants in North America, Europe, Asia Pacific, Latin America, and Middle East & Africa. The report provides the actual market size of automotive lubricants aftermarket for 2017 and estimated market size for 2018, with forecast for the next eight years. The global automotive lubricants aftermarket has been provided in terms volume and revenue. Market volume has been defined in kilo tons and revenue in US$ Mn. Market numbers have been estimated based on type and application of aftermarket automotive lubricants. Market volume and size have been provided in terms of global, regional, and country level. The report comprises profiles Market players have been profiled in terms of attributes such as company overview, financial overview, business strategies, and recent developments. Currently, the global vehicle fleet is dominated by ICE vehicles, which are diesel and gasoline based. However, there has been inclination toward the electrification of vehicles, especially in Europe. This is expected to limit the expansion of the automotive lubricants aftermarket, since electric vehicles do not use engine oils, and more than half of the demand for current automotive lubricants in the aftermarket is dominated by engine oils. In terms of application, the passenger vehicle segment dominated the automotive lubricants aftermarket in 2016. This is mainly attributed to the sheer size of the world passenger cars fleet size in comparison to commercial vehicle fleet size. The passenger vehicle fleet count for the year stood at 947,080 thousand units in 2015 against commercial vehicle fleet size of 335,190 thousand units for the same year. This is responsible for the high demand for aftermarket automotive lubricants used in passenger cars. Increasing shift toward the adoption and consumption of synthetic based lubricants is paving the way for future opportunities in automotive lubricant aftermarket, as smaller engines and lighter vehicles require low viscosity grade lubricants, which is possible only with synthetic formulations. Europe and North America are mature regions of the automotive lubricants aftermarket, with car ownership rates as high as 580 and 680 per thousand inhabitants. However, low penetration of automotive vehicles, particularly in regions such as Latin America, Asia, and Middle East & Africa, presents significant opportunities for the automotive lubricants aftermarket. For instance, the motorization rate in Asia, Africa, and Latin America stood at 105, 42, and 176 per thousand inhabitants, respectively, in 2015.